Starting this year, the BMWED is mounting an outreach program targeted at you – the rank-in-file membership. It is our goal to reach every member personally over the course of the next two years, in an effort to listen and learn, inform and inspire, and engage in the prosperity of our Union. Suffice to say, this will not be an easy task, but I have assembled a team of internal organizers that I am confident will be up to this essential assignment. But, mostly, the success of this program – and, in turn, the success of the BMWED – begins and ends with you. Time and again, the feedback from lodge meetings, in-person conversations, and the results from any number of our past membership surveys, consistently reports that you want to hear from your union, see and meet your union, and speak to your union. We hope that coming to visit you will open this dialogue and address this occasional and undesirable disconnect. We want to see you personally and we hope it will be engaging, productive, and beneficial. Together, through thoughtful and constructive meetings, we can build upon the strength of our Union. This internal organization project has already begun. 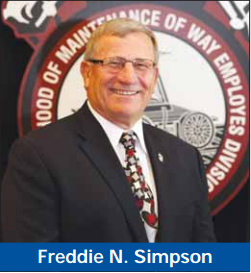 On Dec. 9 and 10 of last year, around two dozen BMWED members of various System/Federations and railroads gathered at the National Division office in Novi, Mich. The idea was to develop a plan of action that aims to improve communications with their elected Union officers, develop stronger engagement with rank-and-file members, and strengthen our Union. From that meeting, we have brought in and worked closely with internal organizing experts, with the objective of reinforcing our Brotherhood's unity. We have and will continue to study, discuss and diligently consider all avenues, plans and suggestions. The BMWED takes great pride in its members and the value our collective action brings through bargaining and protective representation, wage premiums, health and welfare benefits, seniority job protection and due process rights. But, in order to protect what we have already earned through decades of hard fights and strenuous bargaining, we want to reignite a flame of unity. Our internal organizers -- Roy Miller in the Northwest, Roy Morrison in the West, Renato Rufo in the Northeast, Matt Weaver in the South and At-Large organizer Jason Richert, along with their coordinator Carey Dall and our Director of Organizing, Tim McCall -- are working hard at the outreach. Events in Atlanta and Kansas City, in addition to a few location visits near the Novi, Michigan office, represent our initial reach outs, with several more to follow. The response from membership has been encouraging. your System's General Chairperson or contact BMWED Education Director Rick Inclima at (202) 5086449. The BMWED is you. This Union is comprised of us all, brought together to provide strength, security and viability. We are at our strongest when we are organized and committed as a unified force.